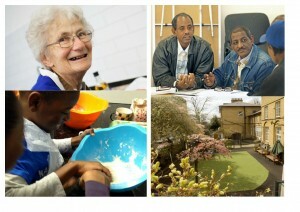 Manor Gardens has been helping people get healthy and stay healthy for more than 100 years. We are independent and funded entirely through personal donations, grants and contracts. The demand for our services is going up but the money from contracts and traditional funders is going down. Donations are our life-blood and ensure that we can continue to support the people of our local community who need most help. Your support means we can work directly with the people who need our help and make a real difference to their lives. Even if you can only give us a small amount, it will go directly towards funding our services. £10 will help us buy new items to help our Pre-school children learn. £15 will help us take our Friendship Network members to the theatre or Christmas Lunch. £20 will help us buy another Christmas hamper for our Friendship Network members. £25 will help us put on a cook and taste session to help people eat healthily. £50 will help us take our Stroke Club members on an outing. £100 will help us train a Mental Wellbeing Champion. We really need your help. Please donate whatever you can afford. If you are a UK taxpayer and agree to Gift Aid your donation we receive an extra 25% from the tax man at no extra cost to you. We are running a special appeal for our Dahlia Project, which offers therapeutic group support to women who have survived female genital mutilation (FGM). This work changes the lives of women, most of whom have never talked about the effect it has had on their lives before. Please give generously. We are running an appeal to provide more therapeutic support groups for women affected by FGM. Donate here.